The Farm to Fermentation Festival happens on Sunday August 24th in Santa Rosa. Photo courtesy of Jennifer Harris. 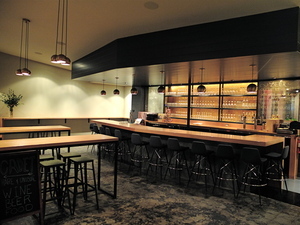 Cadet Wine & Beer Bar in Napa offers pop-up chefs and industry nights with rare wines and beers. Photo courtesy of Cadet. Park 121 in Sonoma’s Cornerstone Gardens. Photo courtesy of Park 121. Farm to Fermentation Fest: We’re gaga for fermented foods—everything from chocolate, wine, cheese, beer, and pickles to lesser-known goodies like kefir, kombucha, and beet kvass. Which is why we’re always first in line at the annual Farm to Fermentation Festival organized by Wine Country fermentation cheerleader, Jennifer Harris. This year’s event will be on Sunday August 24th and includes a DIY pickle station, fermented root beer float bar, a kraut-off, cheese pairing with Madame de Fromage, as well as 20-plus classes and 45 vendors (don’t miss the beer, hard cider, and mead tastings). Details and tickets online; 11am-5pm. Santa Rosa Finley Community Center, 2060 W. College Ave., Santa Rosa. Crudo at Cadet: Chef Dave Cruz (Bouchon, Ad Hoc, and the soon-to-open Miles Restaurant) will guest host a limited-engagement pop-up crudo bar at the recently opened ~CADET WINE &AMP; BEER BAR~ in downtown Napa. The noshfest will run the next two Thursdays, August 21st and 28th, from 6pm-10pm, paring carefully curated wines and beers with crudo. Run by hospitality alums Colleen Fleming and Aubrey Bailey, Cadet is a neighborhood gathering place that explores unusual libations from the Napa Valley and beyond. We’re especially loving Monday’s Industry Nights, when rare wines, grand crus, and large-format beers are poured for the local wine cognoscenti. 930 Franklin St., Napa, 707-256-9606. Another Napa food truck rolls into St. Helena: Serving up a seasonal menu of bruschetta, spiedini, salads, rotisserie chicken, and sweet treats, the ~CLIF FAMILY BRUSCHETTERIA~ truck is now open at the winery’s tasting room, Velo Vino in St. Helena. The truck’s compact kitchen is manned by chef John McConnell, formerly the chef de cuisine at Napa Valley’s Michelin-starred Terra restaurant. Open Wed.-Sun., 11am-5pm. 709 Main St., St. Helena, 707-968-0625. In this season of bounty, the food festivals just keep on coming! The 9th Annual Taste of Petaluma kicks off on Saturday August 23rd with more than 50 local restaurants, chefs, food purveyors, wineries, and breweries taking part. Every year, BiteClub gets a taste of something new happening in southern Sonoma County. We’re especially excited about newcomers Free Range Provisions & Eats, Red Boy Pizza, Secret Kitchen (a BiteClub fave), Native Kitchen, Jezebel Donuterie, Roast & Vine, Thistle Meats, and Zodiac. Sheesh, where was I when all these new spots opened? Get your taste of Petaluma from 11:30am-4pm, $40; details online. Bistro Ralph Ends Brunch: Rumors that longtime Healdsburg restaurant ~BISTRO RALPH~ was, gasp, closing have turned out to be greatly exaggerated. What is true: the restaurant has ended its Sunday brunch from 10am-3pm as of July 27. The good news: your chicken paillard and chicken livers are are still being served all day long, from 11:30am to close. Phew. 109 Plaza St., Healdsburg, 707-433-1380. Park 121 After-Hours Opens at Cornerstone: I’ve never quite known what to make of Sonoma Valley’s ~CORNERSTONE GARDENS~. Part art installation, part tasting room hub, part garden, and part restaurant, it’s an amazing Wine Country destination that’s finally finding its groove. This week, chef Bruce Riezenman of Santa Rosa’s Park Avenue Catering opens ~PARK 121 AFTER-HOURS PIZZA AND EMPANADA KITCHEN~ at the gardens. The walk-up eatery will be open from 4pm-7pm(ish) Thursdays through Sundays until October. And if you’re wondering how 7pm can be “after-hours,” remember we’re in Wine Country, where many wineries are dark by 4:30pm. 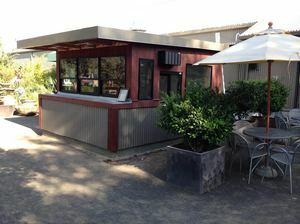 Riezenman also runs Park 121, a cafe, grill, and market, daily from 10am-5pm at the gardens. 23584 Arnold Dr., Hwy 121, Sonoma.